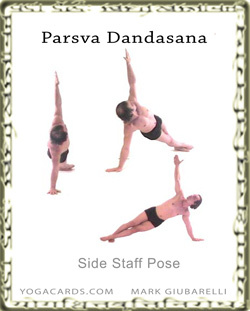 Enter this pose from Downward Facing Staff pose. Rotate the body and align the hips and shoulders vertically. Use the top legs foot to stabilize the pose and point the other foot. below). Placing one foot flat on the mat provides stabilization in this posture and is good for this reason but it also creates a bow energy that runs up the outer edge of the hip. It allows weight and force to be shifted on the palm of the hand so that it is more evenly distributed and lessens the forces moving downward on the hand reducing the pressure on the wrist. Another of the arm strengtheners this pose also tones the shoulders and other major muscles such as the serratus anterior, the trapezius, rhomboids and levator scapulae, deltoids muscles, the scapular muscles and rotator cuffs which is made up of four muscles the supraspinatus, infraspinatus, subscapularis,and teres minor. This pose increases strength, balance and stability by developing many arm muscles, including the tricep, biceps and many muscles in the forearms. The shoulder muscles are strengthened and also muscles in the chest. These are pectoralis major in the chest and lower down in the torso the abdominal muscles. Pelvic muscles are also strengthened when the tailbone is tucked in to prevent lordosis inward curve of the lumbar spine.